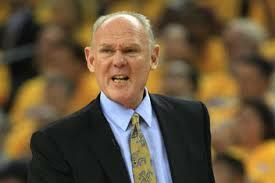 The NBA’s Coach of the Year, George Karl, of the Denver Nuggets has been fired, according to a source with ESPN. Karl had one more year on his contract and wanted to come back to the team, but after their GM left for Toronto, the team decided that they wanted to go in another direction. Karl led a team with absolutely no All-Stars to a 57 win season and a 3rd seed in the playoffs. Yes, they lost early again. Karl has only made it out of the first round once out of nine times. I get that part. But he hasn’t always had the best players. He had a young, more immature than now Carmelo (hard to believe after this, I know), and a bunch of below average players. Even this season, their leading scorer was Ty Lawson with 16.7 PPG (31st in the league). The Nugs were 38-3 at home this season which was best in the league. They were also 24-4 after the all-star break. Karl has coached 25 seasons and has a 1131-756 record but can’t seem to get it done in the playoffs. You can bet that a team is going to pick him up for next season. He has already talked to the Clippers. This entry was posted in Celtics and tagged basketball, boston sports blog, clippers george karl, coach, Denver Nuggets, fired, george karl, george karl fired, heat, nba, NBA Playoffs, nuggets, spurs, western conference by christoph131. Bookmark the permalink.